NSHRF is hosting the Associated Medical Services (AMS) project grant, postdoctoral fellowship and doctoral completion award program. The purpose of these competitions is to promote scholarship, teaching and public interest in history of health care, disease and medicine. The deadline to apply is April 6, 2018, 2:00 p.m. AST. The AMS Doctoral Completion Award is designed to support full-time dissertation writing leading to dissertation completion for a doctoral student in the humanities or social sciences, writing on a history of medicine/healthcare topic. Winners will receive a $25,000 stipend. AMS Project Grant is designed to support small budget proposals on projects featuring the history of medicine and healthcare. Winners will receive a max of 10,000 for one year. 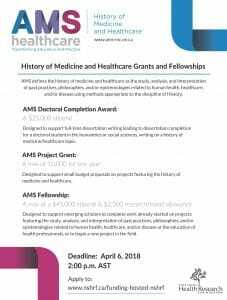 AMS Fellowship is designed to support emerging scholars to complete work already started on projects featuring the study, analysis, and interpretation of past practices, philosophies, and/or epistemologies related to human health, healthcare, and/or disease or the education of health professionals, or to begin a new project in the field. Winners will receive a max of a $45,000 stipend & $2,500 research/travel allowance. Application requirements and information about the award are detailed on the NSHRF website at https://www.nshrf.ca/funding-hosted-nshrf. Information on using the Grants Management System (GMS) and Canadian Common CV (CCV) is available here.